Toyota Canada is finally sending the 2017 edition of its little Prius c hybrid subcompact to dealerships. No major changes here, but some details to talk about. First of all, Toyota has added a matte black body kit to both trim levels of the Prius c, base and Technology. The car also receives black front and rear bumper trim, blacked-out headlight clusters and a black spoiler on its liftgate. The car actually isn’t any sportier, but the add-ons could help the Prius c turn a few more heads. The base trim’s optional Upgrade Package as well as the Technology trim both get newly redesigned 15-inch alloy wheels. The 2017 Toyota Prius c now features the Toyota Safety Sense – C package as standard, which includes pre-collision warning, lane departure warning and automatic high beams. This roundup of active safety devices used to be reserved to the Technology version. Under the hood, the car is still equipped with an Atkinson-cycle, 1.5-litre four-cylinder engine, an electric motor and a continuously variable automatic transmission, for a combined output of 99 horsepower. Fuel economy is rated at 4.9 L/100 km around town and 5.5 on the highway. In short, it’s one of the most fuel-efficient cars on the market that doesn’t need to be plugged in. Base price for the 2017 Toyota Prius c is set at $21,975 before freight and delivery charges, or $740 more than the 2016 edition. Or roughly the extra cost of the Toyota Safety Sense – C package. For another $1,495, the Upgrade Package adds, among other things, a backup camera, cruise control, higher-quality cloth seating surfaces, alloy wheels, a 60/40-split folding rear seatback and a leatherette-trimmed dashboard. 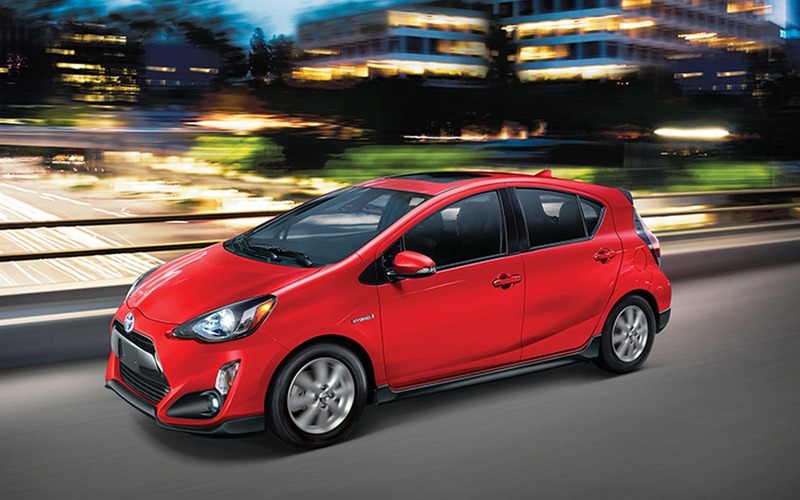 Last but not least, the $26,980 Prius c Technology features a power sunroof, heated front seats and an intelligent key.